When I spoke to the journalist, I believed I was talking about a different photo that had been online several weeks previously in that area. The prints in the sand in this photo, are a dogs breakfast of anything..but what was interesting was he tail like marks in the sand. RESIDENTS fear a panther is prowling the woods in the border region of southern Lake Macquarie. A big cat could be lurking in thick scrub around Wyee, Morisset and Lake Munmorah, resident Jim Briggs said. Speculation is rife among residents about several big-cat sightings. 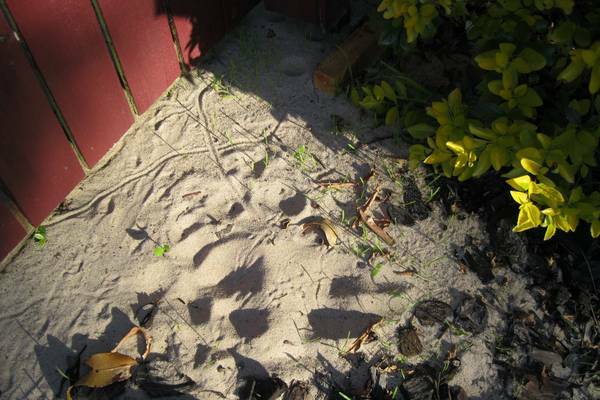 Mr Briggs, of Lake Munmorah, said he recently found paw prints in sand in his backyard, which adjoins a state recreation area. "I thought straight away it was a panther because a few big cats have been sighted around here," Mr Briggs said. "The paw prints were as big as my hand and I have a bigger than normal hand size." Mr Briggs said he showed pictures he took of the paw print to National Parks and Wildlife Service officials and they were "astounded". A ranger later told him it appeared to be the print of a "huge wallaby", but Mr Briggs said there was no way it was a wallaby. A National Parks spokesman said its officials had been shown the photos but couldn't draw any conclusions. Mike Williams, of the Australian Big Cats website, said it was hard to tell anything from the pictures. "I'd love to tell you it's a panther, but it could be a double wallaby print," Mr Williams said. Mr Briggs said there were other signs of a big cat in the area. "Not so long ago a workman found a half-eaten wallaby in bush between Wyee and Morisset," he said. He believed a big cat was near his yard around Christmas. "My son's dog, a Staffy, sensed something and he came to the door looking absolutely petrified," he said. "Staffies aren't frightened of anything, but we couldn't calm it down." Chris Coffey, from Grose Vale in the Hawkesbury area, established a "big cat database" in 1998. Ms Coffey has recorded 560 big-cat sightings in NSW since then, including at Palmdale, Narara and Gosford on the Central Coast and at Berowra. Ms Coffey began the database because she had seen a black panther on her property five times.